Metaltex produce a wide variety of bottle racks that help to store the maximum amount of bottles, in the smallest amount of space. Our bottle racks are available in various sizes, storing bottles in quantities of 6-24, 36-48 or up to 72. Made in Italy with hard-wearing materials to stand the test of time, many models are stackable, allowing you to fill an entire cellar wall. Store, display and preserve your wine in a sophisticated manner, with a bottle rack from Metaltex. Your entertaining space will finally feel complete when you add this stunning bar unit. Providing plenty of space for storage, a wine rack that can hold up to 15 bottles, a closed cabinet, six open shelves and three inverted racks for hanging wine and martini glasses. This highly functional bar unit isnt just practical, its beautifully modern: the rich finish is enhanced with shiny chrome-finished accents, and its straight edges add a contemporary feel to your space. Step into a comfortable surrounding that is Americana. Rustic design elements are apparent in the strong lines of the raised panel front and hand-applied antiqued white rubbed through finish providing an aged worn look. Constructed of poplar solids with oak veneers over engineered wood. The Americana Bar features a physically distressed oak finished top featuring worm holes, fly specking and small indentations. Other features include 1 storage drawer, 1 door with cabinet storage, 4 shelves (2 adjustable) and matching brushed nickel metal foot rest. Finish and measurements may vary slightly. Assembly required. Size: 52-inch W x 21-inch D x 42-inch H.
The Stillwell High Dining Bar Table, is a cool and sophisticated way to incorporate an eating area into a smaller or more compact space. Room for four and effortless, Mid-Century design elements are seen throughout with the airy open legs and seamless silhouette, that instantly draws people to it. In the kitchen or in the dining area, this table works well in both and the effortless design and style guarantees it will be around for years to come. Bardolino 72-Bottle Wine Rack Metaltex produce a wide variety of bottle racks that help to store the maximum amount of bottles, in the smallest amount of space. Our bottle racks are available in various sizes, storing bottles in quantities of 6-24, 36-48 or up to 72. Made in Italy with hard-wearing materials to stand the test of time, many models are stackable, allowing you to fill an entire cellar wall. Store, display and preserve your wine in a sophisticated manner, with a bottle rack from Metaltex. Bardolino 72-Bottle Wine Rack is rated 2.4 out of 5 by 5. Rated 1 out of 5 by TinaA from Bardolino wine rack I bought this wine rack a few months ago. Very disappointed. It does not hold wine bottles. It is a waste of money. I filled the rack and the wire could not hold the weight of the bottles. They ended up falling and crashing down. On the hunt for a sturdy wine rack. Waste of time and money! Rated 3 out of 5 by redwine from flimsy Gauge of wire is too light for this span as it sags when loaded. Wall connection for rack at the base is directly behind upright so making it difficult to anchor to wall. 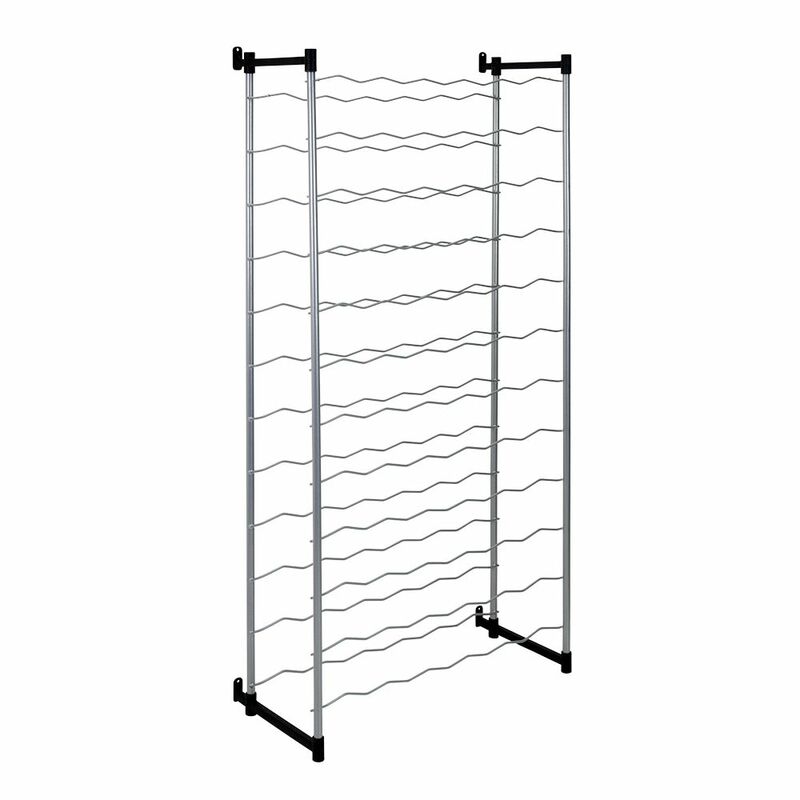 Rated 2 out of 5 by justme from Flimsey Wire racks are too light a gauge. Loaded with wine there is a 1/4" dip in the middle. Also hard to anchor the bottom of the uprights to wall as the connector is directly behind the upright. Poor design. Rated 1 out of 5 by MJS1 from Flimsy rack Placed a few full 750 ml wine bottles and they seem to 'bounce ' around. Almost afraid to leave any bottles on rack. Maybe empties would be fine.